What does the Asian FTA explosion look like? On paper, East Asian regionalism looks rather tidy…A very neat hub-and-spoke arrangement with ASEAN at the center… While this tidy description is attractive, the reality is quite different. ASEAN has a rather unique method of negotiating FTAs. Every nation defines its own sensitive list. And preferences are only granted on goods that are on neither partner’s list. This means that the actual tariffs applied on any given good can be quite different for each of the 45 bilateral trade flows among ASEAN nations. What this means is that AFTA actually should be thought of as 45 separate bilateral agreements, although of course the existence of ASEAN means that the 45 are coordinated to some extent. For the same reason, the China-ASEAN and Korea-ASEAN are likely to operate like 10 separate bilaterals with limited coordination. 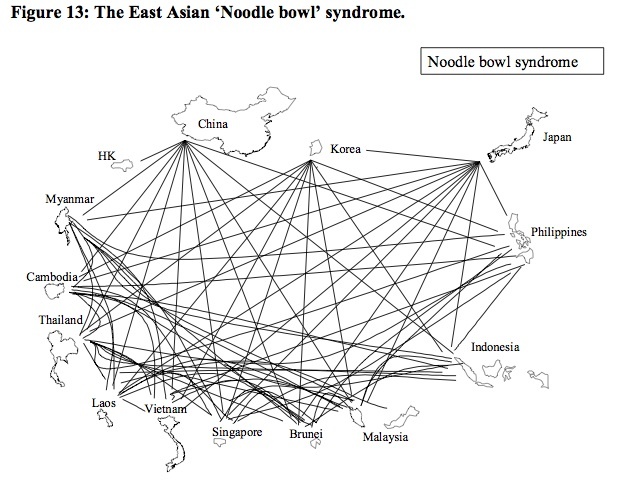 Thus the real picture is marked by what might be called “the Noodle Bowl Syndrome”. Many of those FTAs are still being negotiated. Even most of the already completed FTAs haven’t fully kicked in: real tariff discrimination will be phased in between now and 2010. The liberalization that created the massive intra-regional trade we see today was mostly unilateral liberalization not preferential liberalization. East Asia has yet to see what real discriminatory trade liberalization means, but it is scheduled to find out soon. This entry was posted in Preferential Trade on 19 July 2006 by jdingel.